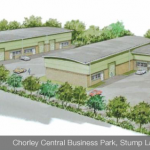 We are delighted to announce that with immediate effect we have a 2,500 sqft unit available to let on the ever popular Chorley Central Business Park on Stump Lane in Chorley. Unit 17 is only a few years old and has been constructed and fitted out to an extremely high standard. It benefits from large rollershutter door access, as well as an impressive personnel door entrance into the reception area. The unit comes equipped with W/C and kitchen facilities as well as dedicated car parking spaces. It is available at £13,750 pa + VAT & Service Charge.